Bringing conversation, joy and comfort to critically and chronically ill patients through the healing power of art. Our mom was in the palliative care unit at the Foothills Medical Centre for the last 5 weeks of her life in January/February. She had been battling cancer for the past 6 years. During her time at the Foothills, mom loved choosing the pictures that would be placed on her walls. One picture in particular really meant a lot to her – it was a picture of a polar bear cub in the snow. Her sister had stayed with her almost every night that she was in the hospital and she also fell in love with this polar bear picture. With Art a la Carte’s permission, we purchased the picture and our mom wrote a special note on the back of the picture to give to her sister to say thank you for helping her through the last days of her time on earth. Mom gave her sister this picture two weeks before she passed away. I want to thank Art à la Carte for the impact they’ve made on our family’s lives. The City of Calgary is well-known for its vibrant arts community; the performing arts as well as the visual arts can help Calgarians to celebrate beauty, be inspired, nurture their feelings and enrich their daily lives. However, this is not the case for thousands of people in our City who are long term residents in our hospitals and care centres. Recognizing that the sterile hospital environment can be forbidding, Art à la Carte was created 24 years ago to fill this aesthetic gap, bringing a compelling and unique program of art and inspiration to patients in these centres. 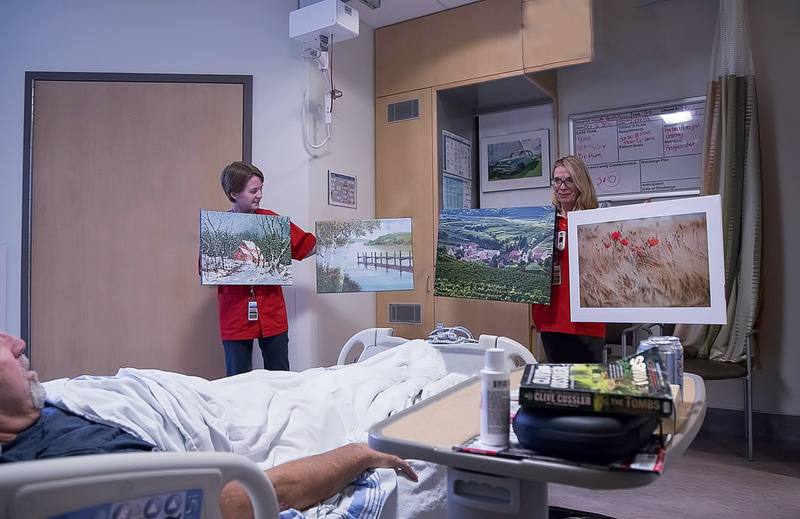 What began in 1994 with a sampling of photographs placed on the wall of a single hospital room has grown into a collection of 300+ pieces of diverse art that is brought to the bedside of Calgary patients. 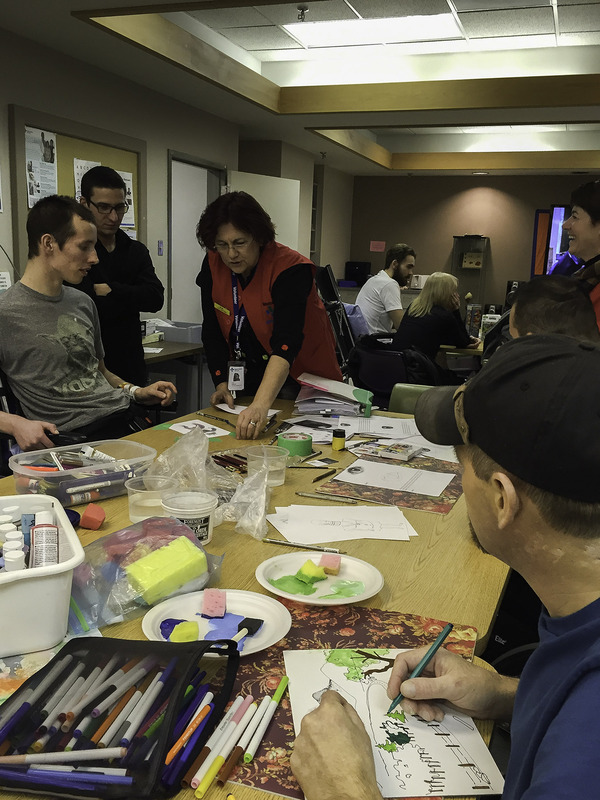 More than 85,000 visits have been made to Calgary health care facilities by compassionate volunteers who offer comfort to patients, families and caregivers through the bedside art program which is a compelling and unique complement to patient care. 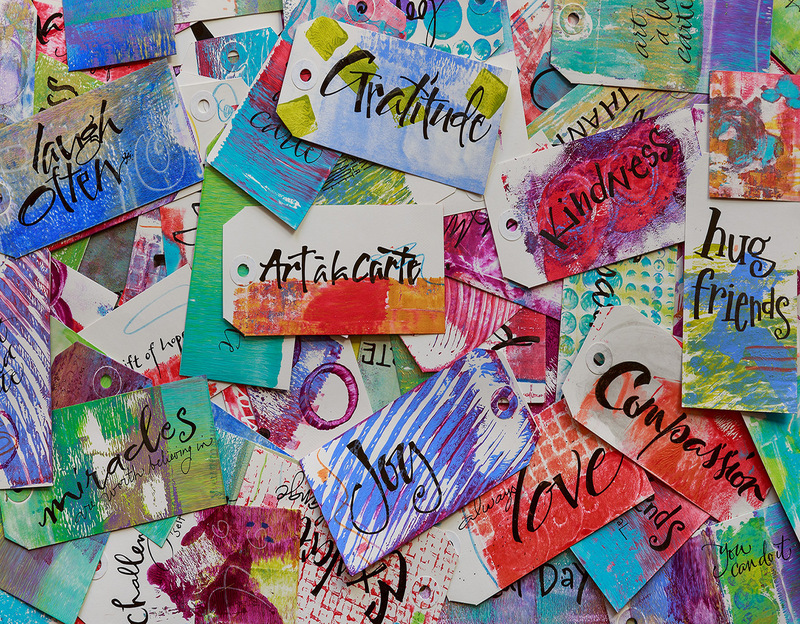 Art à la Carte’s mission is to create powerful connections through the arts with the vision of being recognized as a leader within the Calgary healing arts community. To most people hospitals and other medical settings are frightening and uncomfortable places. This was certainly true for educator, role model and humanitarian, Patti Hronek, who spent the last year of her life at the Foothills Hospital bedridden and unable to move. Patti had a rare form of bone cancer that ravaged her body beyond recognition, but it could not tarnish her indomitable spirit. When a friend offered Patti a choice of original photographs to place along the walls of her hospital room, the sterile setting was suddenly transformed into a comforting and personalized environment. Surrounded by memories, Patti was able to reconnect with the fullness of her life as she prepared to die. Art à la Carte was established in 1994 as a tribute to Patti Hronek’s remarkable legacy. Today, Art à la Carte has evolved as the only local nonprofit organization to use the visual arts to bring art, conversation, and joy to thousands of people in Calgary medical settings every year. 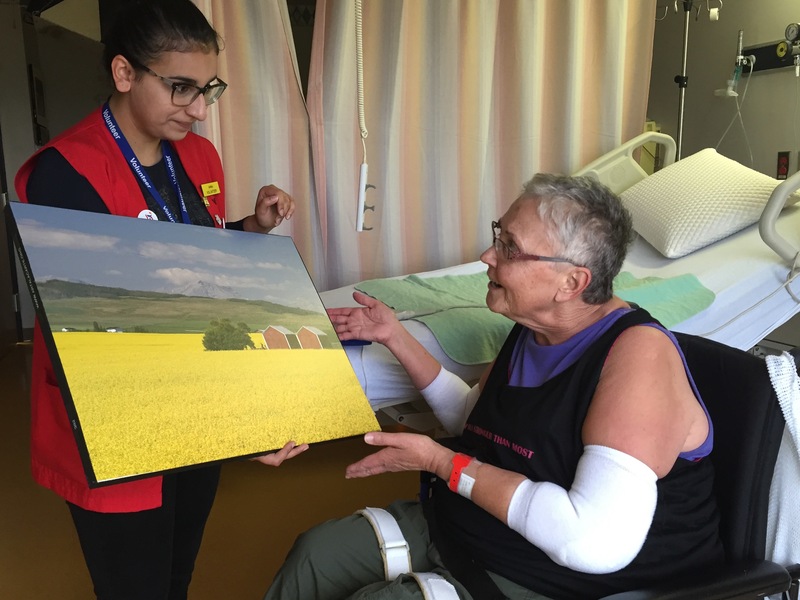 Volunteers make weekly visits to the bedside of acute and palliative care patients, encouraging them to select artwork for their hospital rooms. Cancer treatment areas are also enlivened with virtual skylights, creative murals and pieces of art in an effort to help ease the fear and stress often associated with invasive care. The power of the art is transformative to the patients who experience it, changing sterile and frightening places into a more homelike environment, returning a sense of dignity and autonomy to individuals during times when they are feeling vulnerable and also inspiring those who visit the residents in these care centres. With more than 85,000 volunteer visits in the last 24 years, Art a la Carte is a master at using art to restore a sense of connection to the world beyond the hospital walls. 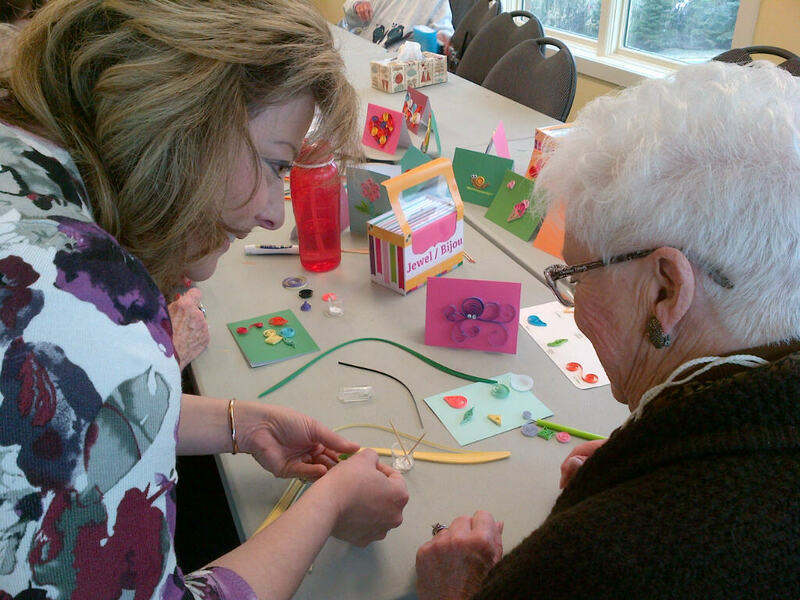 Art à la Carte has created a bedside program where volunteers visit patients in acute and palliative care. Patients are invited to choose the artwork that hangs on their walls and they appreciate the opportunity to select themes that are personal and meaningful to them including landscapes, wildlife, or travel destinations. Our programs have been enthusiastically embraced by patients and hospital professionals, both of whom recognize the profound impact the program makes to the experience people have in the hospital community. 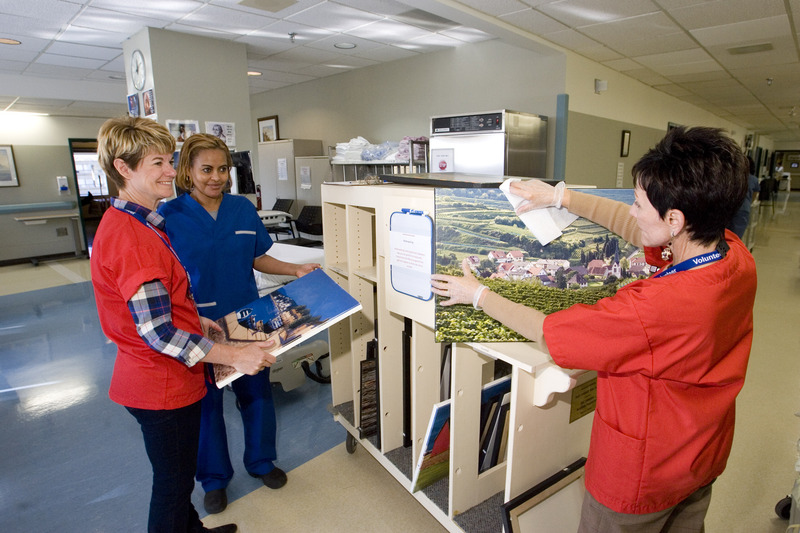 Patients also report that they look forward to the friendly and caring volunteers who bring the art – literally on a cart – to their rooms. In 2016, ­­­­60 passionate volunteers delivered 1.678 hours of service and 68,844 patients experienced the power of art in healing through Art à la Carte’s Art for Patients programs. This number increases exponentially with the inclusion of family members, visitors and caregivers – all of whom are equally inspired by the art. 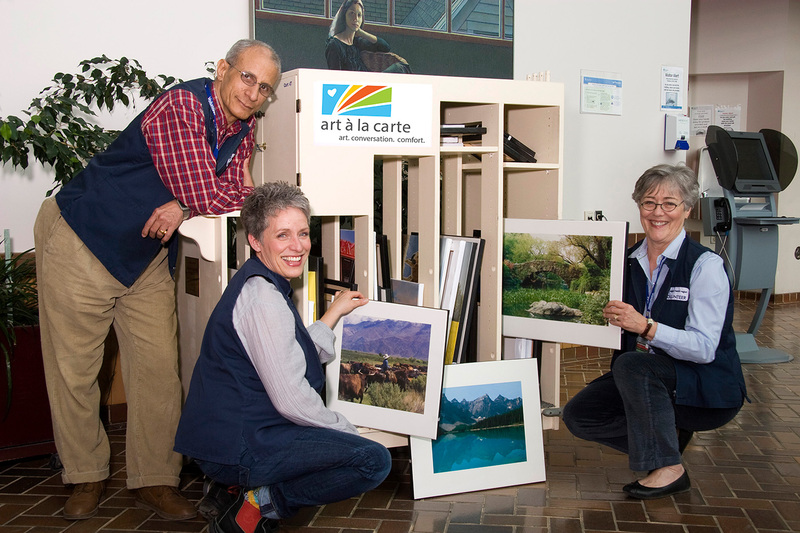 Art à la Carte is the only program of its kind in Calgary. 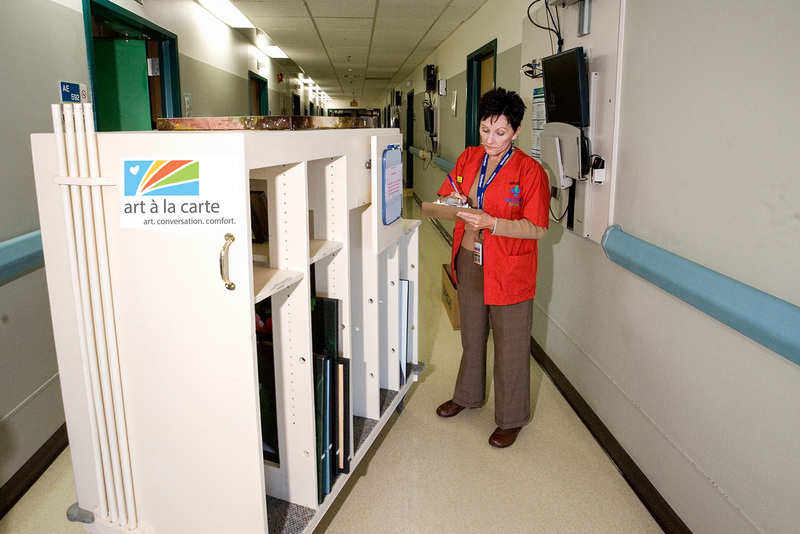 The concept and delivery is so unique that other Canadian hospitals and hospices have created similar programs based on the Art à la Carte prototype. Both qualitative and quantitative research projects have been undertaken to identify the outcomes associated with program delivery and it has met with resounding endorsements. Art à la Carte now offers expressive arts programs in two forms Create While You Wait and Opening Minds Through Arts (OMA). 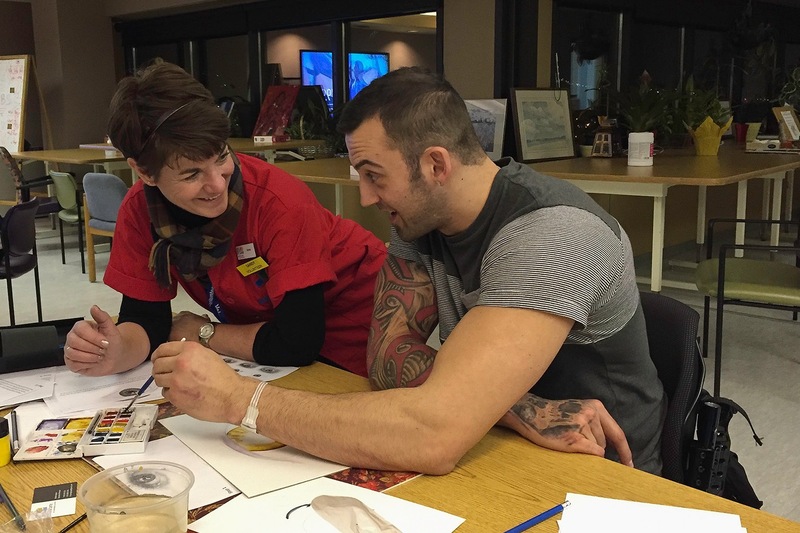 Art therapists and skilled volunteers support healing by providing guided art activities for patients recovering from strokes or brain injuries, and families living with dementia. Create While You Wait is delivered once per week at the Foothills Hospital. OMA is offered in six-week sessions at the South Health Campus. Samples of artwork co-created by volunteers and their “artners” are framed for sale to the public at the conclusion of each session. VOLUNTEER Read about Jim Krueger, one of our dedicated volunteers.